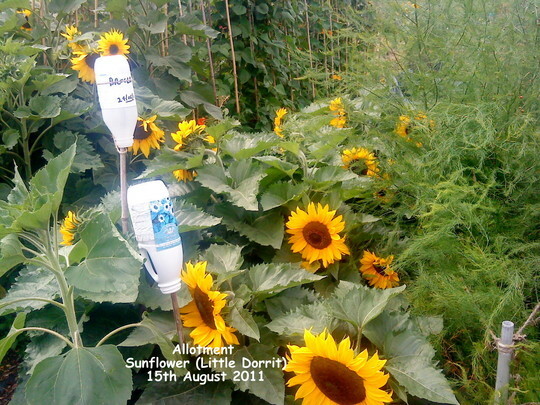 This journal is about, you guessed it – Sunflowers, Sunflowers & yet more Sunflowers! LOL! 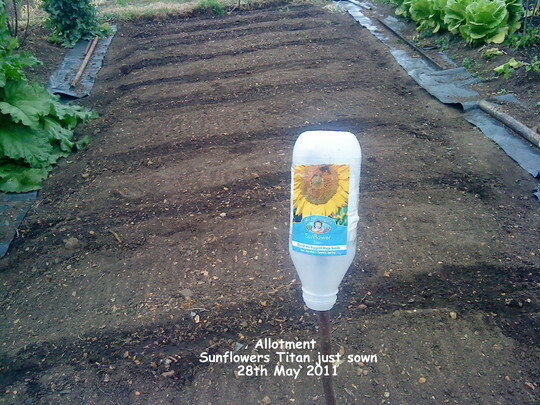 During the last week of May I sowed 100s of Sunflower seeds! Some were saved from last year & some were bought by Gerry this year. 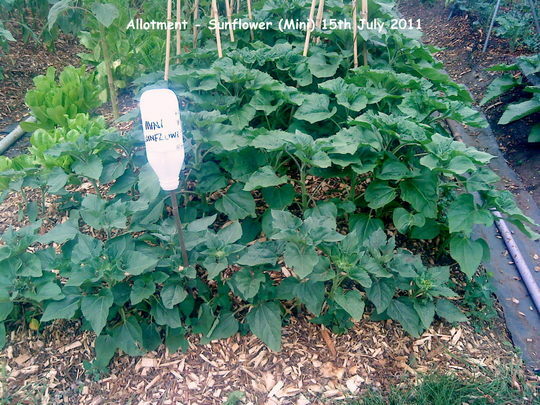 There were two types, basically, of seeds, some were tall & others were short. I saved a lot of seed from the tall ones we grew last year but didn’t know their name – in my photos of these I just call these “Tall”. I also saved some of a short kind, again with no name. These in my photos I just call “Mini”. 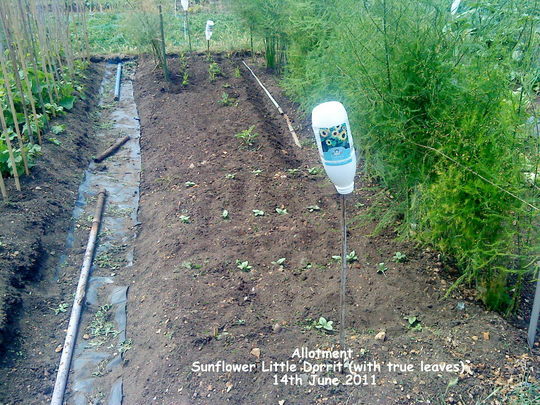 Then there were a couple of packets that Gerry bought & gave to me to sow. One packet was of a variety called “Titan” whereas the other was a dwarf variety called “Little Dorrit”. 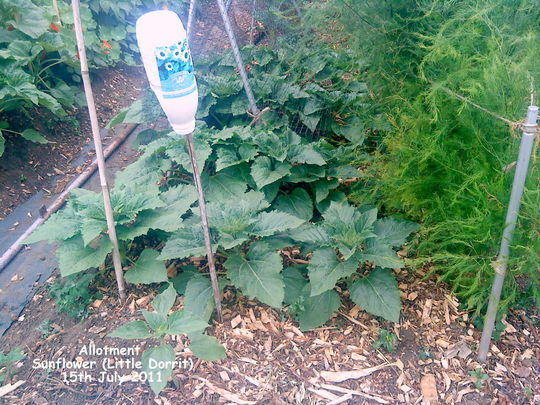 “Little Dorrit”, has enormous leaves & enormous flower heads! It’s a shame they aren’t held higher, above the foliage, as this hides them somewhat, as can be seen in the photo. But their growth is very much determined by the available water supply! Where they received very little water they remained very dwarf – just like last year. But where they received more water they have grown at least twice the height of the ones that received very little water! Nowhere is that more obvious than those I planted at the end of the runner bean bed, these show a marked difference between those that ended up among the beans & those that are bordering the pathway! I overestimated the number of Runner bean plants that we would have & put up too many canes. 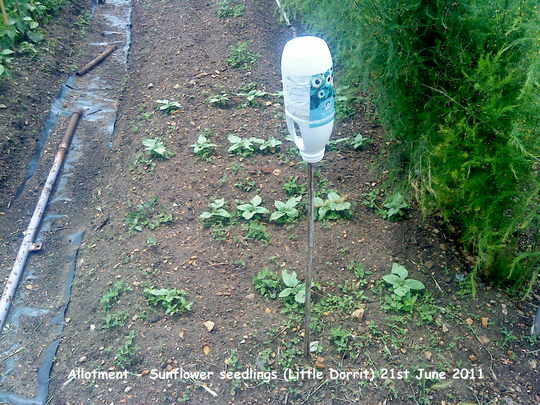 The last few pairs of canes remained empty but I couldn’t take them down again without prejudicing the entire framework so I sowed a few rows of dwarf Sunflower seeds to cover them up a little. 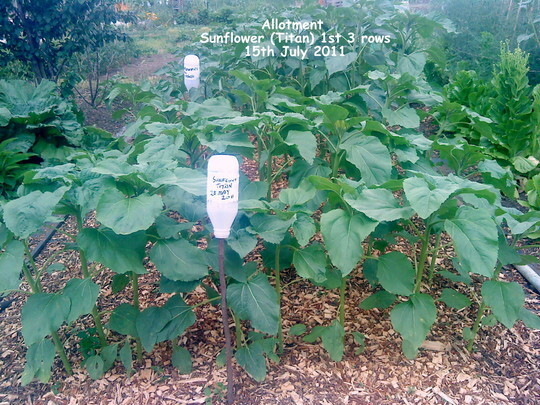 As these rows got much more water than the other Sunflowers they grew a lot taller! You can see the end result in this picture. 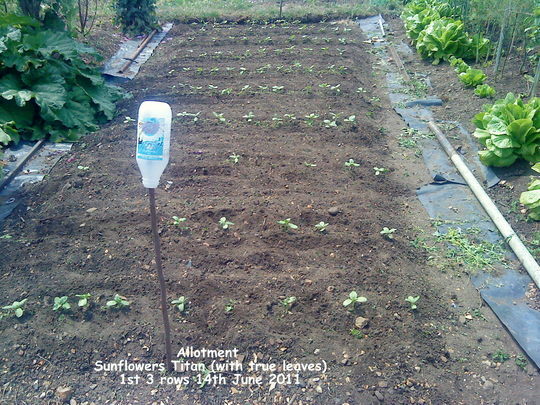 The other photos show the progress of “Titan” from sowing to flowering. 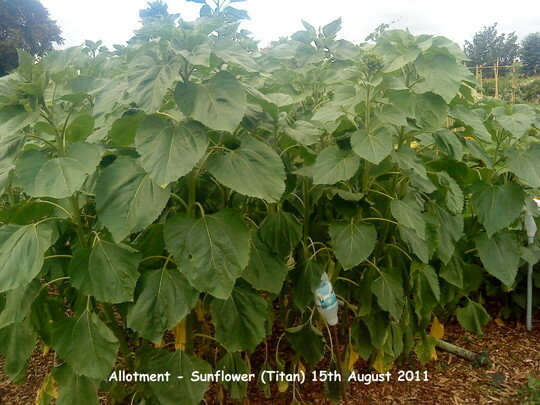 Titan hasn’t grown nearly as tall as some of the other “Tall” ones from last year. 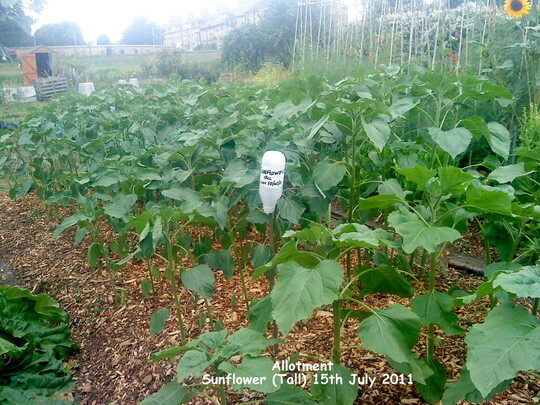 There is no way we could have won a prize for the tallest Sunflower on the plot like we did last year! I think that was Gerry’s idea when he gave me them! 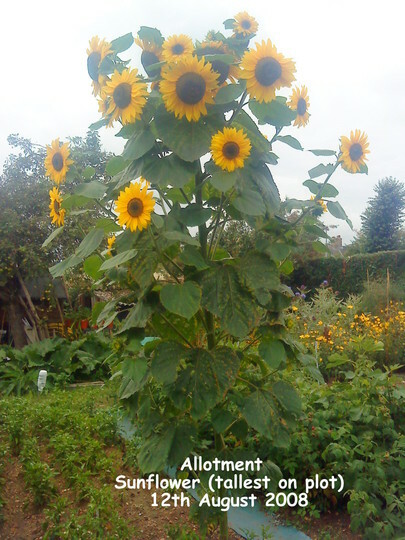 The self-sown Sunflowers have been mostly multi-headed & the tallest of all is a multi-headed one like the one that won us 1st prize last year. 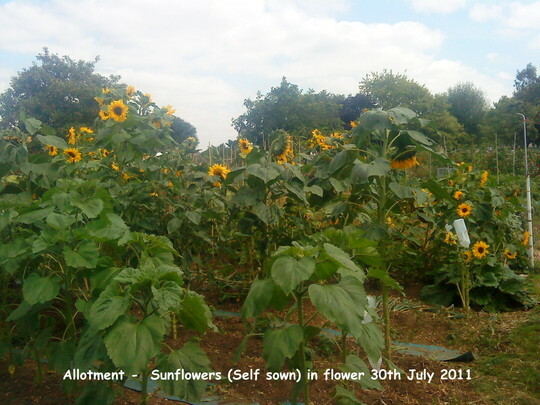 We have only had two pale yellows amongst the self-sown & none – as yet – amongst the ones I sowed. 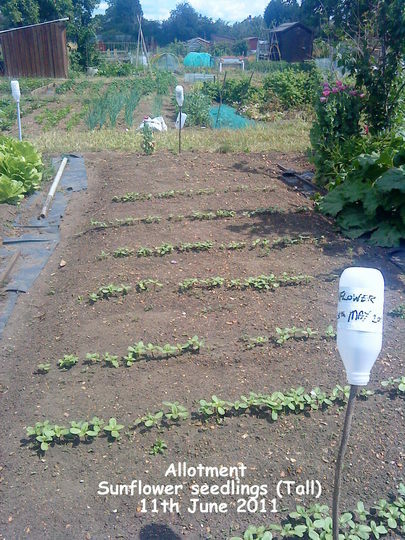 A last photo is of the dozen or so that I transplanted from where they were growing previously – something I wasn’t sure could be achieved successfully – some from pots of Strawberries, others that had germinated in the allotment soil. They will continue to be a lovely spectacle for weeks to come! 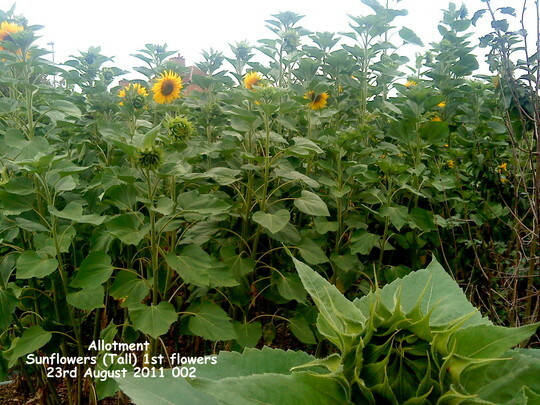 Next post: My very own plot - This time 12A! Wow they are gorgeous I really love the flowers on Little Dorrie and the minis, they are beautiful. Such a cheerful flower aren't they. They make the day seem a little brighter. That is a really good show. I did something similar a few years ago, from a book, Sunflower Folly. I planted maroon, Teddy and the regular old fashioned ones. Found the same thing you did...water. But I see them in the farmer's field, growing away with no care. The deer eat mine, and the birds...Yours really turned out well. Thanks for sharing the process. Glad you like them so much, Samjp! :-)) They are very bright & cheerful! The minis have really made the plot look brighter! @Wells: After the first few weeks I haven't watered them any more. We have had some rain but not very much. The ones nearest the beans got water from the beans so they have grown taller but the shorter ones are near the path, hence near me when taking the photo & they haven't benefited from the watering of the beans. That's such an interesting blog, Balcony! Do you ever find any problems with fungus, like botrytis? Every time I try sunflowers, they seem to be struck down by fungus attacks? My zinnias succumbed this year too. Maybe it's just the sheer amount of water this year, and still air. Do you ever spray for funguses? I'm just picking your brain because your plants look so healthy...I want to know your secrets! Lol! :0) You and Gerry must be pleased with them, they're beautiful! Hi Nana, I'm happy you think my blog is lovely! 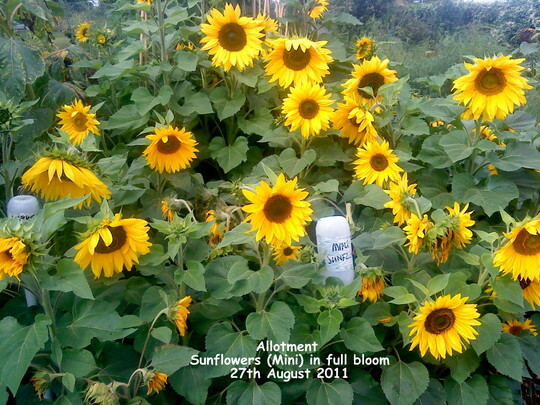 :-)) Sunflowers make such a brilliant display in the late summer garden! Although I like the tall ones I think I'd be more interested is seeing the ones I've termed "mini" as they are at a height you can appreciate more! @Libet: I didn't know they could be attacked by botrytis! Here we certainly don't have that problem! 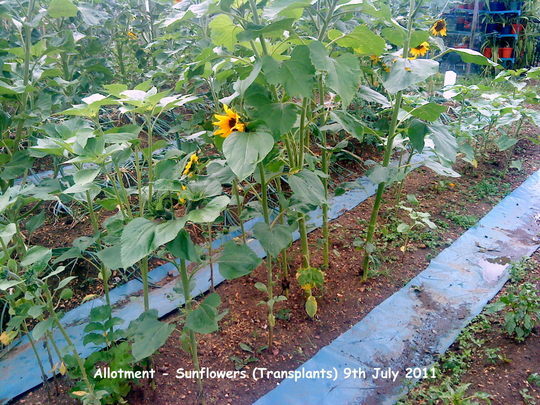 The Sunflowers are healthy not because of anything we do just because they are! 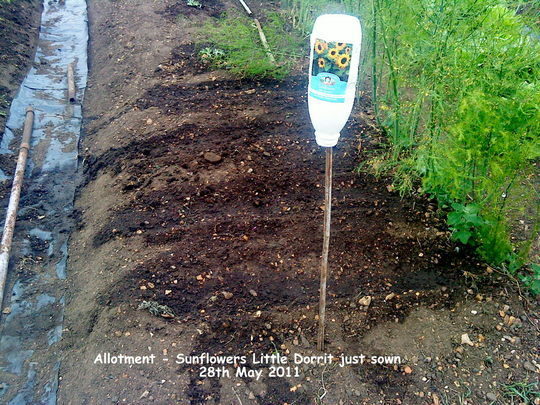 They've received very little attention from us since a few weeks after their germination. They were watered a few times while they were still very small but once they had developed about 3 or 4 pairs of leaves they have had no water from us. 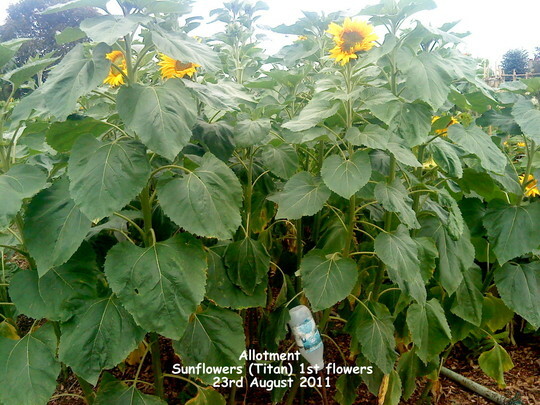 Exception being "Titan" which has received quite a bit more water, & even fertilizer, to try to get them to grow as high as possible in an attempt to win the 1st prize for the tallest Sunflower for the 2nd year. My efforts have be vain for two reasons, one being that a guy on another plot had some that were much taller than ours & 2nd, perhaps most importantly, there hasn't been a competition this year after all! I'm sorry I have no "secrets" to share with you! 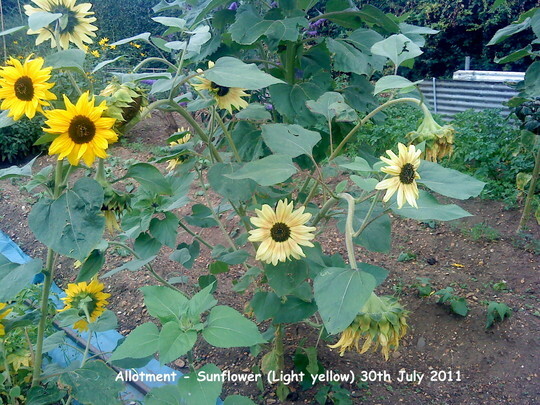 Our Sunflowers, particularly those I've called "tall", have even been wilting during the warmer hours of the warmer days! Even so I never gave them any extra water! Well, now that I remember that's not strictly true as I have watered them, but only on a rare occasion. The transplanted ones are the exception to the general rule here in that they have had a lot more water than any on the others, in fact probably more than all the others combined! They seemed to struggle all the time up until August when they have at last taken off & soared skywards! 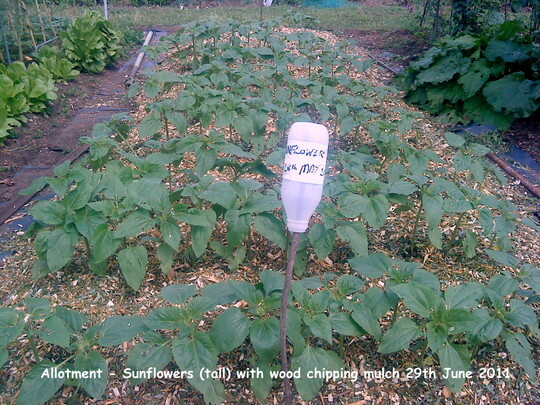 Lovely blog balcony and gorgeous sunflowers, have you seen the price of them in GCs? it amazes me that people buy them, in flower too! I used to grow mini one's, Teddy bear, they were lovely. 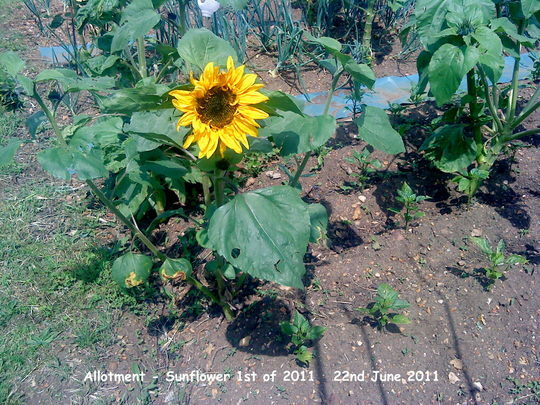 fluffy, like a teddy bear lol..
That is some sunflower "tallest on plot 2008"......fantastic!! They're wonderful, especially when there are lots of them together. I like the multi headed ones. I haven't seen them before. It was interesting to see their progress. Thanks YDD, I'm happy you like them! We have some mini ones on the plot but Teddy Bear isn't among them nor have I ever grown it. I like the ones Gerry put in last year, I saved some seeds & as I don't know their name I've called them "Mini" on my photos. I like them more than "Little Dorrit" that Gerry bought this year which produce very big heads of flowers & enormous leaves but the flowers are half hidden by the leaves! @Linda: I think you have made a mistake with the years, we won the 1st prize last year, 2010! There has been no competition this year. Shame the wind knocks them over for you, Holly, but you can get shorter varieties that look everything as spectacular as the giants! In fact, as I mentioned somewhere, I actually prefer the "mini" varieties now over the giants! Though the multi-headed ones are spectacular! Hywel I'm so glad you liked seeing their progress, I thought that was better than just showing them in flower. I like to make my blogs varied & interesting & I seem to have succeeded with this idea! Which variety is it that gives you more than one flower? Seems like you have a wonderful amount of sunflowers! I have no idea of what it's called, sorry! They came from some Gerry must have sown at some time in the past, he grows lots every year! He's not in the habit of keeping the seed packets, he just throws them away once he has planted the seeds! 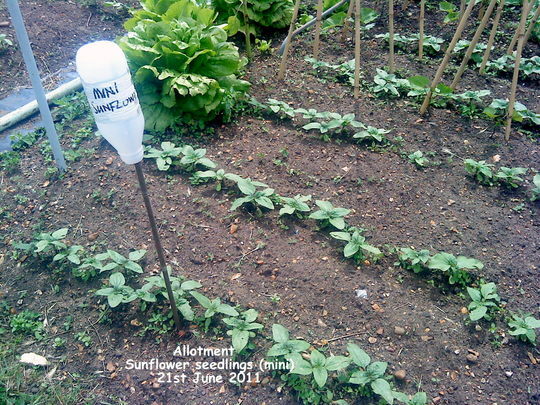 I like to use the seed packets as labels - till they rot /get blown away! 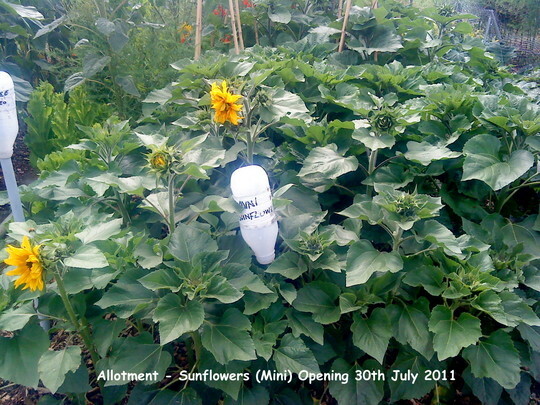 On the allotment it occurred to me to tape the packets to the milk bottles that way they wouldn't rot/get blown away! 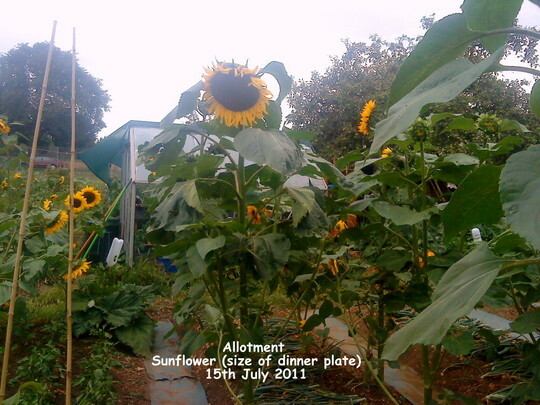 In spite of the strong winds of the last few weeks the Sunflowers are holding up remarkably well! :-)) Most of the self-sown (volunteer) plants have now been uprooted & thrown on the heap at the top of the allotments field. The flower heads had been cut off by Gerry, for his birds, others had been cleaned out by the wild birds.